A film picturing an incredibly beautiful and exotic culture that incorporates more than meets the eye in this time of turmoil, it pays to look at the tiny island of Bali where for centuries the people have lived a meaningful life beyond the material. For the Balinese there are more important things than the accumulation of wealth in one lifespan: They think it is better to lead their lives well and so acquire what they call Karma Pala. Good Karma Pala ensures them rebirth into a new and potentially higher cycle of existence. "None of us are new souls, we are all old souls", says Tjokorda Raka Kerthyasa, a Balinese prince who is the main character in the new feature length documentary on the spiritual life of Bali called "SACRED & SECRET". For the Balinese reincarnation is not a mere belief but a fact of human existence. The film sheds light on the celestial wheel of existence, and bears witness to the biggest royal cremation in the last three decades when the energy, mysticism and creativity of Hindu Bali comes together in spectacular mass ceremonies. Bali may never again see a cremation as huge as this one. The Balinese however conservative and faithful in their beliefs are not afraid of change: as Tjorkorda Kerthyasa says in a typical Balinese way, "Cultures come and go. It's just a matter of time. Don't be afraid of change. There is nothing absolute." It is as though some great protection has been given to this small island fortifying its religion that has survived amidst the Islamic Indonesian archipelago, the world's largest Muslim nation. The New York Times Correspondent who witnessed the event was overwhelmed by what he saw: `Tuesday was a day of raucous energy as thousands of volunteer porters in purple shirts carried the giant emblems of the ceremony like armies of ants bearing impossibly large objects. `Strange as it seems, it is in their cremation ceremonies that the Balinese have their greatest fun.´ wrote Miguel Covarrubias in his classic work, "Island of Bali," published in 1937'. An occasion for gaiety and not for mourning, since it represents the accomplishment of their most sacred duty to liberate the souls of the dead. However "SACRED & SECRET" goes beyond being an outside observer of the events. The crew got unprecedented access and insight into some of the occult ceremonies guarded since the medieval times when the Majapahit Kingdom, based in Java, ruled over most of S. E. Asia. Tjokorda Raka Kerthyasa traces his ancestry to the Majapahit rulers when they established their court, culture and sacred writings during the 15th century in Bali. Bali Hinduism is alive and well in its unique form found only on this island. "SACRED & SECRET" looks at how the beliefs and occult ceremonies of these long bygone times have survived so well. The film lets its viewers witness some of the most mysterious rituals still to be found on this extraordinary island with one foot in the traditions of the past, the other firmly striding into the future. Unlike other emerging nations, consumerism has not killed Bali's spiritual values.Once a year in a little hamlet in a hidden remote part of the volcanic island villages fall into trance and start to fight armed with traditional knives. It defies logic to see how they all escape the night's ordeal exhausted but unharmed after cleansing their village from demonic influences. Just as astounding, and never permitted to be filmed before, we show temple scenes of pre-menstrual girls suddenly possessed by protective spirits while performing an elaborate sacred dance. Healers still have an important place in Balinese society. We filmed people suffering under serious disorders suddenly restored to health, after a night's visit to a famed healer. The Balinese view such phenomena as perfectly normal because for them another reality lies behind the tangible outer world they call the Sekala. It's the invisible inner world of the Niskala, the abode of powers far greater than those in our every day reality. Here reside deities and demons influencing and controlling the world as we experience it. 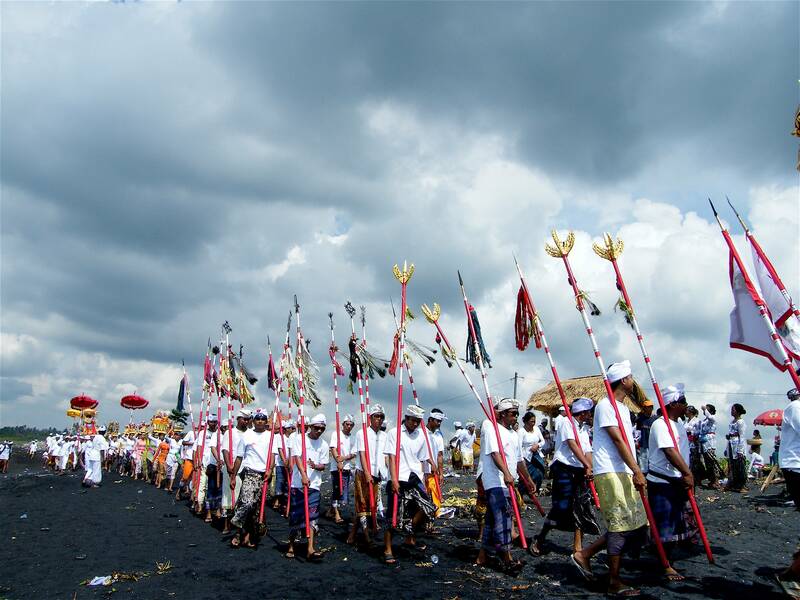 For the Balinese, the streams of colorful rituals are about striking equilibrium between these two realities. The film not only lets its viewers immerse themselves into an exotic island life, and the people's fascinating rites of passage, but in going from an outer to an inner life provides a timely reminder that there are things more important than the material world suggests. Even if some of their beliefs are beyond our understanding, they have guided them through centuries of geological and political upheaval, and of late the bombs of fanaticism. The vigor of their practices has forged an extraordinary sense of identity. They have an effervescent joie de vivre. They know who they are.